"Mr. Frodo, look! It’s an Oliphaunt. No one at home will believe this." 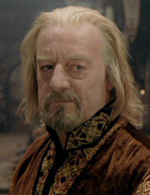 Bernard Hill plays ThÃ©oden, the King of Rohan. Bernard Hill was born on the 17th December, 1944, in a Catholic, working-class family in Manchester, England. He studied at Manchester Polytechnic, gaining a Diploma in Theatre in 1970. He worked in theatre and television through the 1970s, and had roles in the television series “I, Claudius” and the film “Gandhi”. His first major television role was as Yosser Hughes in the early 1980s series “The Boys from the Blackstuff”, Alan Bleasdale’s gritty drama about unemployment and depression in working-class Northern England. The realism of the experience left Bernard emotionally scarred, and he refuses to talk much about the series even today. However, his portrayal of Yosser Hughes did win him his first award, the Press Guild’s award for Achievement of the Decade. He also won critical acclaim for his stage and screen performances in a number of Shakespeare plays, and took roles in a number of cult English films such as “Bellman and True” and “Squaring the Circle”. He started taking major international roles in the 1990s, with his most memorable performance before Théoden being as Captain Smith in “Titanic”. In 1994, he received a British Academy award for his starring role in Skallagrigg. Bernard was originally auditioned for Gandalf, but was not deemed suitable for the role. However, Peter Jackson kept pursuing him, and in autumn 1999, while directing a UK production of “Who’s Afraid of Virginia Woolf”, he borrowed a camera and a Rohan-esque barn from a friend and taped himself in a Théoden scene using lines supplied by Philippa Boyens and Fran Walsh. When Peter Jackson saw the tape, he immediately offered Bernard the role of the Rohan king. Bernard became good friends with both Viggo Mortensen and Peter Jackson during the long filming in New Zealand. When his son came to stay with him for a while, the two of them spent a good deal of time with Peter Jackson and his son Billy. He loved the country, and spent some of his leisure time skiing and bungee jumping. Bernard also joined in the cast injuries list, cracking his sternum while shooting a fight scene. Bernard has a young son, Gabriel, and a daughter, Jay, from a previous relationship. He is married to a film editor. He lives now in the Waveney valley on the Suffolk-Norfolk border in the east of England, in a 16th century farmhouse. He loves horses, and has spent time with Monty Roberts out in America learning his training methods. He also wants to get involved in Monty Roberts’ work for children through his International Learning Centre.